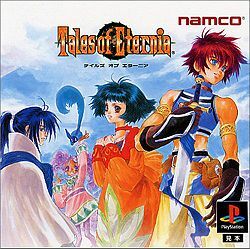 Tales of Eternia is a Japanese PlayStation action role-playing video game released by Namco on November 30, 2000, selling 873,000 copies and later ported to the PlayStation Portable on March 3, 2005, selling 398,000 copies. Eternia is a 2D anime-style RPG with an original real-time battle system taken from its predecessors, Tales of Phantasia and Tales of Destiny. 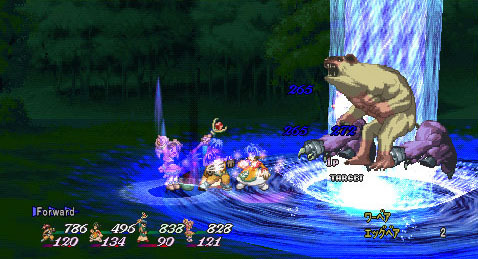 It is the third "Mothership Title" of the Tales RPG series; the Linear Motion Battle System, as well as various other aspects from previous Tales titles, still feature prominently. Its North American release was titled Tales of Destiny II to avoid trademark infringement on the name Eternia, owned by Mattel in North America for the Masters of the Universe toyline. 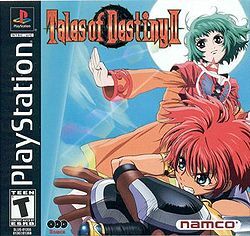 The naming choice later caused some confusion after the release of the PlayStation 2 game known as Tales of Destiny 2, a genuine sequel to Tales of Destiny taking place in the same fictional world. 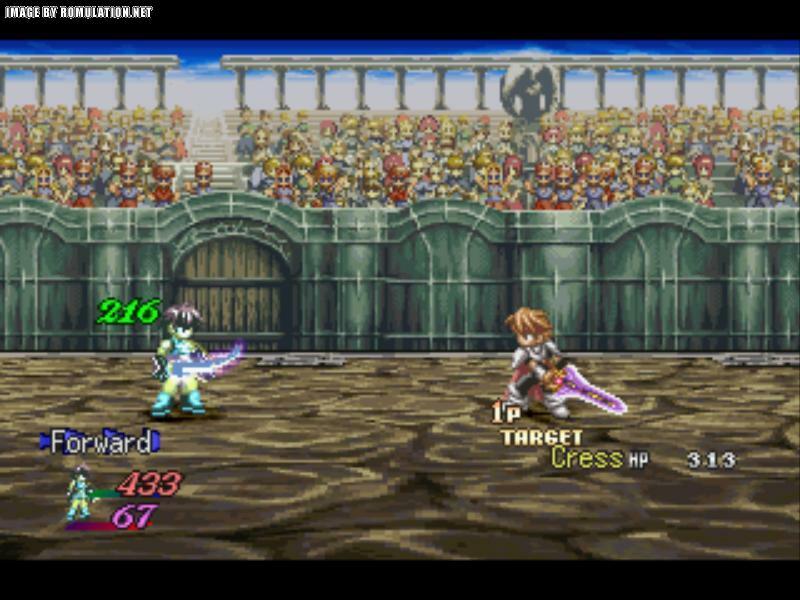 Tales of Eternia is not directly related to Tales of Destiny, except for a few brief character cameos that are typical of all Tales series games after Tales of Phantasia. Both the North American and Japanese releases of the game feature an anime introductory video; the Japanese version has an accompanying song called flying by Garnet Crow. 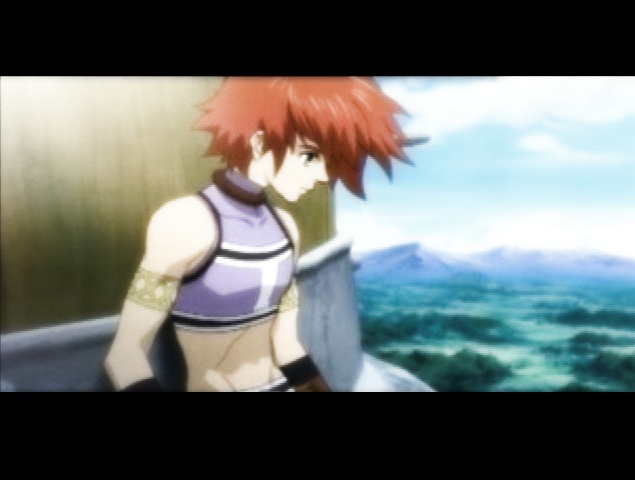 The game inspired Tales of Eternia, a 13 episode anime series co-produced by Production I.G, which is loosely based on the game. The series focuses on the four main characters while introducing a few new faces in a subplot unrelated to the game's actual plot. All 13 episodes of the series were animated in early 2001. Tales of Eternia follows Reid Hershel as he tries to prevent the Grand Fall, a cataclysmic event that would destroy his planet along with that of newly-found traveling companion Meredy. Specifically, the Grand Fall entails the violent collision of twin planets Inferia and Celestia. The journey takes Reid across both planets, as he seeks out those responsible for this movement towards the brink of annihilation. The story takes place in Eternia, a world where two planets, Inferia and Celestia, face one another, separated by the Orbus Barrier. Interaction between the two planets has been infrequent over the last few centuries despite their proximity; the Bridge of Light linked Inferia and Celestia in the distant past, but the link has been severed for an extensive period of time. The Aurora War, an ancient conflict that set Inferia against Celestia over two thousand years ago, continues to generate persistent mistrust between the two groups. The Orbus Barrier has shown recent signs of weakening and possible collapse due to the actions of an unknown external force. Reid Hershel, along with his childhood friend Farah Oersted, notice an unusual change in the color of the Orbus Barrier coupled with the flight of a strange ship from Celestia. When they go to see what happened, they meet Meredy, who is dressed in a strange fashion and speaks a bizarre foreign language, and her pet Quickie. Consequently, Reid and Farah visit their childhood friend, Keele Zeibel, in search of answers regarding the identity of Meredy. Reid learns that she speaks Melnics, an ancient civilization's language. After traveling to Morle, Reid's group receives a special translation earring that allows communication with Meredy. Reid continues on to Inferia City, the global capital. The group asks the King of Inferia for help, but Reid is accused of spreading fear and confusion throughout the land; the punishment is a death sentence. The princess wants to know more about what Reid has to say, so the group is released. Reid explains the situation, and the leaders of Inferia hold an organizational conference. The Inferians announce they will uncover the Bridge of Light and stop the Celestians from executing the Grand Fall by taking aggressive military action. Reid is aided by Efreet, Undine and Sylph; the group is led by Rem to the Bridge of Light, which resides atop the highest mountain in Inferia. After climbing the mountain, Reid locates the Bridge of Light in its stone sanctum. Reid's group is confronted by Ras, who tells them that his real name is Rassius Luine, a senior knight loyal to the Kingdom of Inferia. Ras loses to Reid in combat, and watches the group escapes via the Bridge of Light to Celestia as Inferian reinforcements arrive. Upon arrival in Celestia, Reid is greeted by the citizens of Imen, Meredy's hometown. Reid travels by rail to the ruined city Luishka; a professor there examines Reid's body as he houses an unknown fibrill, or magical energy. Reid discovers the Greater Craymel Gnome in a nearby cave, and the group enlists his help. Reid stumbles upon Chat's hut, and the party is accepted into her crew after a series of puzzle-based tests; the group now has access to the sea-based form of transportation. Using the Van Eltia, Reid reaches Peruti, the frozen town near the dominion of Greater Craymel Celsius. Reid climbs the nearby mountain and helps Celsius regain her sanity, saving Peruti. Reid's group is invited by Max to join the Shileska liberation army in order to stop Balir, the cause of the Grand Fall; however, Meredy senses pain and suffering from Imen, so Reid decides to return there first. When the party reaches Imen, the city is in ruins with the majority of its citizens killed. At the technologically advanced city of Tinnsia, Reid meets with Ayla and Max, the leader of the Shileska liberation army; Max joins the party. After finding the Greater Craymel Volt trapped in a machine at the Ruins of Volt, Reid frees him and receives his power. Using the Craymel Cannon combined with the support of Shileska, the group manages to break through the fleet loyal to Balir. Infiltration of Balir's Castle leads to Shizel, the ex-Queen, who is ruling in place of Balir; Reid is forced to retreat due to the powerful Dark Aurora Arte of Shizel. After improving the Van Eltia and enlisting the help of Greater Craymel Shadow, Reid is given the Divine Aurora Arte by Seyfert, the god who created Eternia. Seyfert wishes to preserve his creation, while Nereid desires the destruction of both planets; only Reid's Divine Aurora Arte can defeat the Dark Aurora Arte given to Shizel by Nereid. The group is now free to travel between the two planets via the Orbus Barrier using the Van Eltia. Reid recruits the Greater Craymel Rem at Regulus Knoll in preparation for the final confrontation at Shizel's Castle. 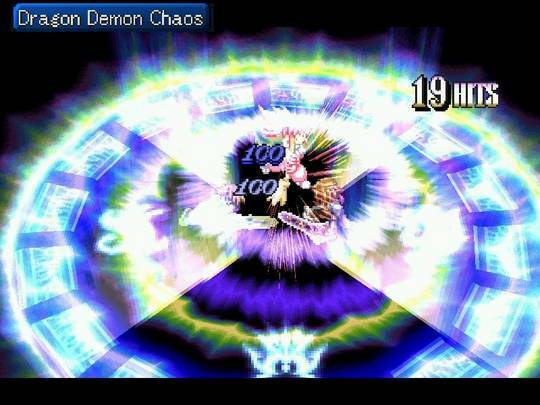 Both Shizel and Nereid are defeated by Reid, who uses his Aurora Arte to counter that of Shizel. However, the Grand Fall continues on unabated despite the banishment of Nereid. 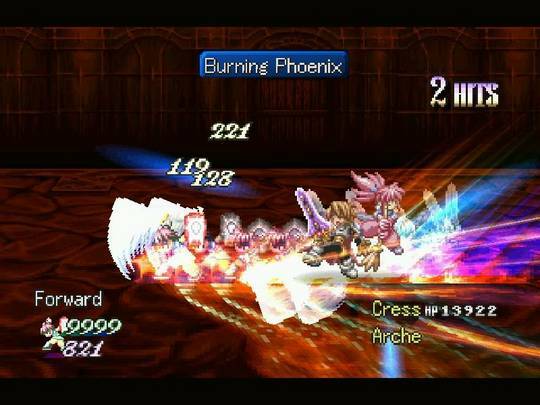 Reid's group is forced destroy the Seyfert Ring, which forcefully connects Inferia and Celestia, using the combined power of the two Aurora Artes; this action stops the Grand Fall, but the two worlds drift apart and the party is split. Despite the separation, Chat's modified Van Eltia can fly from Inferia to Celestia, reuniting Reid with his allies. Now you can add videos, screenshots, or other images (cover scans, disc scans, etc.) 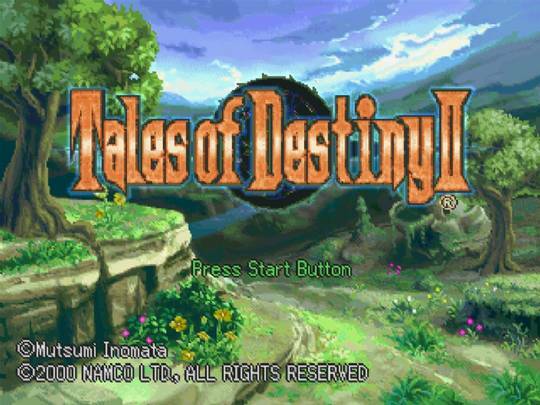 for Tales of Destiny II (Tales of Eternia) [3 Discs] [U] to Emuparadise. Do it now!